There is so much controversy surrounding moms breastfeeding in public. Should it be avoided at all cost or should mothers be comfortable knowing that it’s just fine? I remember asking my mom for a breastfeeding cover. I just wanted a simple one, but instead, she got me a dainty organic cotton nursing cover. To be honest, even if I asked for it because I knew I needed it – I didn’t feel comfortable using it. Initial thoughts of embarrassment creeped in. Without admitting it, I guess I didn’t want people to look at me. And the first time I used it was inside the mall – in a parents room no less – where it was not needed! I know, it was so silly of me! Then yeah, naturally my confidence grew more and more as I saw other moms do it like breastfeeding was the most natural thing in the world. And it sure is! Eventually, I grew so fond of my nursing cover that I really cannot leave home without it (as long as I had my baby with me). Babies have a right to be breastfed and mothers have the right to breastfeed. However, there are people who give snide remarks or even confront mothers. So all this controversy makes you think – is breastfeeding in public taboo or even illegal? Will I be kicked out of a cafe if I was breastfeeding my baby? Remember, no one should discriminate you because breastfeeding is a right, not a privilege. Babies should breastfed anytime and anywhere. It’s not like we can make babies wait or ignore them if they are hungry, right? Nursing tops. Tube tops. Shirts with buttons. Nursing dress. Wrap dress. Name it, there’s a wide variety of nursing-friendly options you can choose from. What’s important is that you choose something easy to wear that won’t expose your belly. I personally love nursing singlets or tank tops (with built-in bras). These are so comfortable to wear during pregnancy and during breastfeeding. You can wear it as such, as an undershirt, or you can even put a jacket over during cooler seasons. You can unhook and hook it back without fuss, and you are not exposing too much skin! You can also look for tops and dresses with nursing slits to make your life better. This will build your confidence and you are clearly not exposing yourself. Choose an appropriate cloth material for the season. If its summer, you can’t use something thick and warm otherwise your baby will overheat and breastfeeding won’t be so enjoyable for both of you. And likewise for winter. There are so many available designs in the market. 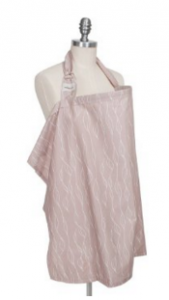 There are those that look like aprons with wire in front, a shawl, or even a scarf – lots to choose from. You can also use a sling or baby carrier. It just takes a little getting used to. If there was a parents room or feeding room say in a mall or airport, feel free to go for it. Otherwise, not all areas will have such a place. So maybe you can opt for a place where there’s not much people or somewhere quiet (if possible). Now, obviously people think differently. And we cannot control that. What we should do is to change our mindset and work on things we can control. Your stare should actually be a smile. After all, you are feeding someone. And if people disapprove, so what? In conclusion, mothers should have a life. Do not confine yourself at home because you feel uncomfortable. What I can suggest is that you feed your baby before you leave home. It might then mean that it will be a while before the need for the next feed. Or perhaps your baby only needs a top up or short feed when you’re out. Breastfeeding is such a joy because you can do it anytime and anywhere. Be proud! You may feel nervous about breastfeeding in public at the start. But there is nothing that practice cannot fix. Just keep at it and your confidence will just keep on growing. Never mind people who will always hate, hate, hate. If you do it discreetly and maintain a positive attitude, there should be no problem. Have you experienced breastfeeding in public? I would love to hear from you. Please leave your comments and share your stories below. This entry was posted in Breastfeeding Challenges, Expressing Milk, Feeding Your Baby and tagged breastfeeding, breastfeeding in public, expressing breast milk, feeding your baby. I was never comfortable enough to breastfeed my babies in public but it’s never bothered me to see a Mom doing so. Just the other day, we were at a cafe at a museum eating at a table next to a woman breastfeeding her child. My sons didn’t notice, but if they had, and asked me about it, I would have had no problem explaining what she was doing. It’s totally natural and the best thing for our babies! Absolutely! Nothing wrong with feeding your baby in public. Thanks for sharing, Teresa! Cheers! I totally agree with your points on breastfeeding in public. It is a shame that it has become such an issue. I just used to breastfeed mine whenever and wherever but I did it with such confidence that nobody ever said anything negative to me and if they gave me a dirty look, I was too busy looking at my baby to notice! Great Advice. I hope women everywhere are empowered by your words. Thanks Kris! It’s so wonderful to hear that you breastfed with confidence and didn’t experience anything unpleasant. It’s really sad though since there are women who continue to get shamed for breastfeeding in public. People need to realize that there’s absolutely nothing sexual about it, and instead we should just show respect to that lovely mom who is trying her best to breastfeed her baby. Awesome post!!! I am an advocate for breastfeeding. Babies should be fed when they are hungry, no matter where mum might be. Breastfeeding is natural and should feel that way. It is very disturbing that when mums breastfeed in public people whisper and she becomes the center of attention. How would others feel if people just stared at them while they ate? Being comfortable while nursing is also a key point and having on proper clothes that makes it easier. Absolutely! Breastfeeding is such a wonderful thing that you do for another person. Feeding your little one shouldn’t really be an issue. You are also spot on in terms of wearing comfortable outfits as it helps a whole lot – even breastfeeding covers help. Thanks Veronica! Thanks Jezza, perfectly understand what you mean. We also don’t have family here so it’s harder as compared to having them nearby so you can get help. Glad that efforts to normalize breastfeeding as gaining more traction nowadays. So its unfortunate for people who make this such a huge deal and criticise moms for breastfeeding in public. Babies need to eat too. Great article! I remember being young and wanting to breastfeed back in the early 80’s. I was living in NYC at the time and it wasn’t as it is now. I always carried a shawl big enough to cover myself and my daughter. I love the cover ups you have on your site and will definitely be sharing this with some younger friends of mine who still like to be modest but still breastfeed in public. Do the nursing covers come in different colors? Thank you meherbani! â˜º Nursing covers are so helpful if you want to breastfeed discreetly in public. They certainly come in different colours, pattern, and style to suit your preference. There are covers that look like an apron, shawl, scarf, and even a hat! They’re pretty and stylish too! Feel free to share this to your friends who are breastfeeding (or about to breastfeed). When I first started going out with my new baby, I was not prepared for the strange looks and rude comments I would receive. As a first time mom I had no idea people felt a certain way about breastfeeding in public (and I used a nursing cover too). It seemed so strange that people concerned their self with how I fed my child. It still strike me as weird haha. I loved how you talked about “smiling.” that is sooooooo true! It goes back to the “kill them with kindness” saying. Great read! I really don’t think people should make it their business, after all, you are covered up and not hurting anyone. A smile goes a long, long way indeed. Thanks Heather! Great information here. I like how you inform other mothers about comfortable nursing outfits. I work at a children shoe store and from time to time a mother will breastfeed her/his child. Most mothers seem to be comfortable of feeding their child in public and I believe that is the way is supposed to be! Thanks Juan. You can basically ear what you want when you are breastfeeding, but life becomes much, much simpler if you are wearing nursing tops or dresses. It is more accessible and you don’t really risk exposing certain body parts. Truly agree that breastfeeding in public should not be an issue in the first place. Hope more and more people have the same point of view. As a guy, whenever I saw a lady breastfeeding her baby I will tend to look away even though she is sitting right in front of me. I am not shy, but it’s more of giving her the respect and space because I am sure if there is a private room all breastfeeding mothers will use them. Good on you! I hope everyone will think like you. Sometimes you just have to feed your hungry baby right then and there. But yeah, there are places with breastfeeding rooms. If there are, then yes it will be great to feed there where you have privacy. Breast feeding is totally natural, so I see absolutely no problem with this and I don’t understand the people who do. If a baby is bottle fed there is no problem, they can have their meal wherever they like, it should be the same for breastfed babies. It’s a shame that there is any need for an article like this, just shows what a strange society we live in. It truly is a shame that we even need to build some awareness about something so natural. Thank you Peter and I hope that our society will have more respect for breastfeeding mothers who are just trying to feed their hungry baby. The way I see it is, if your baby is hungry you have to feed it, regardless of where you are and what other people think. I mean most of us are adults and it is only a breast for goodness sakes. I really do pity people that take offense to it. Thank you Joel! People seem to view it differently, and you’re absolutely right, it shouldn’t be an issue since moms do cover up anyway. Greetings. This is a very useful and powerful post. I have seen very few articles like this and I believe we really need to give information to moms. We shouldn’t be judgmental since breastfeeding is very normal and healthy for children. Thank you so much for writing this helpful article. I wish you the best of luck. God bless you!. Thanks Adeel! Hopefully more and more people will be open-minded about it like you. I can’t believe that people are judgmental about such a natural activity. I breastfed both of my children for two years and frequently did this in public (always with a cover so no-one could actually see anything). I often had people staring at me, despite the cover. There is nothing so beautiful and natural as feeding a baby and it’s time this prejudice was broken. Well done for addressing it! Thanks Erica. Moms should be proud indeed! Breastfeeding is such a natural thing, and our society should not be so quick to judge. I am so glad that you are bringing this topic up to the public. I don’t have children, but many of my friends have been openly criticized for choosing to breastfeed their babies in public. Even with a blanket or nursing cover, people have still overreacted. What really struck me from this article was not feeding your baby in the bathroom! You are so right that that is not a good place to do a feeding. Unfortunately, I have seen many mothers in public restrooms feeding their babies in the toilet area because they were ashamed or embarrassed to feed in public. I don’t believe that women should be ashamed of this because it is natural and necessary for nourishment of children. Thanks for broaching a controversial topic in an unbiased, informative way. Great write up! Glad you feel that way too, Jess. Its really sad that this is our current reality. Hopefully, by raising awareness, people will empathize and understand more, instead of being quick to judge.